It was wild and rainy weather that followed the Griffith Kart Club up to Orange for round 4 of the 2016 Southern Star Series zone championship. Not wanting to be brought down by the weather the GKC had a great number brave the conditions and make the trek to our friends and great racing neighbours at the Orange Kart Club. This being round 4 all bets were off as our racing members were primed for some hard and fast racing. Thanks go out to all drivers, their families, friends and pit crews who spent a lot of time and effort to support the club and Kart racing in general. 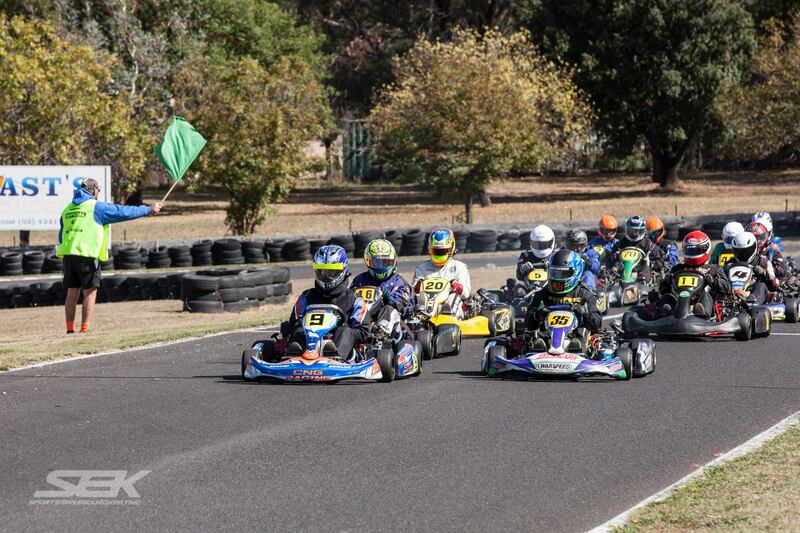 Griffith Kart Club had 12 members compete in the meeting where the total entries exceeded 90 karters and it was good to see some tough racing on Sunday when the weather finally cleared. The event commenced on Saturday September 3rd and the competitors were greeted with a wet track that had suffered from torrential rain and a lot of surface water. Thanks to the hard work of the Orange Kart Club members they managed to get the track into shape when the rain had stopped. Racing started after lunch on Saturday however it was again called off due to misty rain and a thick layer of fog. After waiting for some time and the officials declared the days racing over and everyone retired to their accommodation ready for Sunday. Sunday was overcast but with better weather forecast racing commenced at 7.30am with a full day programmed where 3 heats and a final were scheduled for the day. Thanks to all officials and helpers as they worked very hard to get through a packed programme. Griffith Kart Club had 12 members racing with the usual ups and downs of racing taking place. It was great to see the following club members represent the GKC and do their best during the weekend; Noah Sands (Cadet 12), Mikayla Boots (KA4 Junior Heavy), Jamie Prendergast (KA3 Senior Heavy), Jarrod Prendergast (KA3 Senior Heavy), Connor Vidler (KA Senior Light), Jason Severino (KA3 Senior Light), James O’Callaghan (TAG-R Light), John Macey (TAG-R Heavy), Jarrod Whitty (TAG Light & KA3 Senior Light), Byron Woolner (TAG Light), Stewart Weigand (KA3 Senior Light). Members who managed to pick up trophies included Noah Sands continuing his great form to take the win in Cadet 12. In KA3 Senior Light Jason Severino drove well but was unlucky in the final when his chain broke while leading, he still picked up second place but was left lamenting a possible round victory. Jarrod Whitty continued his good form placing 3rd in KA3 Senior Light and confirmed his driving skill. In TAG-R Light James O’Callaghan picked up the 3rd place trophy after a difficult start coming to grips with the slippery Orange surface. TAG-R Heavy saw John Macey add another trophy to his cabinet, nabbing 3rd place after having to work hard to get pace from his Rotax powered Arrow Kart. In the unrestricted TAG-Light class Griffith Kart Clubs’ Jarrod Whitty took the win from another fast Griffith driver, Byron Woolner who battled hard and left nothing on the track. The 2016 Southern Star Series heads to Wagga Wagga for the 5th and final round of the years season on 1st & 2nd of October. We look forward to more competition and success from GRiffith Kart Clubs racing members.